Decoy’s Six Islands Pool was the venue for the final round of the Wade Cup for Deeping St James AC and winner on the day from peg 17 was Dave Thorpe. He started the match fishing expander pellet on a pole line before switching to the margins fishing corn over pellet to finish with 103lb 2oz. Second from peg 21 was Ray Torrington with 98lb 11oz and third from peg 18 was Pete Molesworth Junior with 75lb 13oz. Paul Dotchin won the three-match series based on aggregate weight with 314lb 14oz. Second was Torrington with 272lb 9oz and third Jon Bowland with 183lb 6oz. 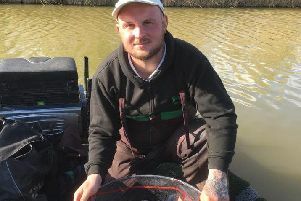 Martin Harwood put a hard earned 37lb 5oz net of carp and skimmers to the scales to top the latest Haddon Lodge match. He fished the pole with pellet and maggot. Second place went to Tony Moles on 20lb 15oz followed by Lucio Melillio on 12lb 12oz. Ken Allum won the Webb’s AC match at Stretton Lakes with a modest 21lb caught on the feeder with sweetcorn. Runner-up with 17lb 8oz was Mick Wright followed by Mike Smith on 13lb 13oz.